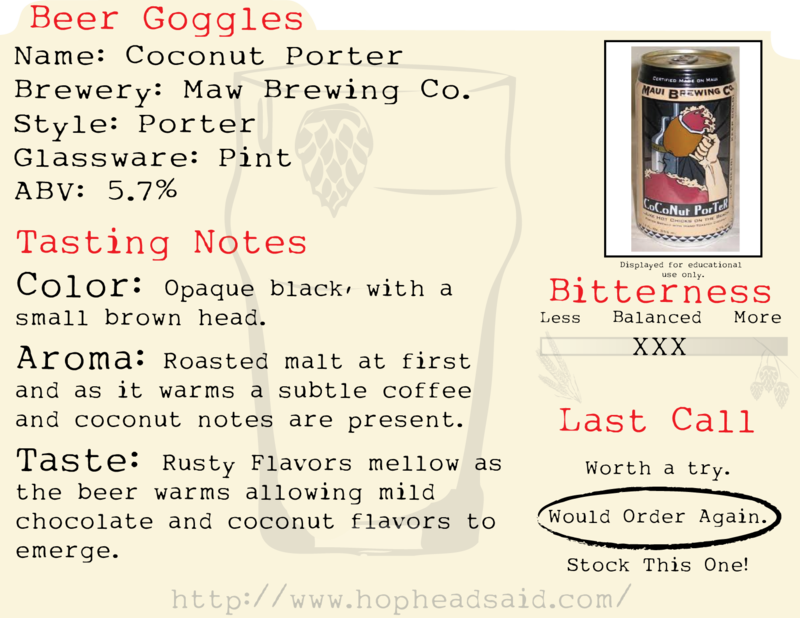 food.paring: Coconut Porter | Hop Head Said . . . Specific soup recipe can be found @ Underwood Family Farm’s blog. General description and suggestion: This beer changes characteristics quite a bit as it warms. When the beer is chilled (40° or below) the beer will seem one-sided roasty with an almost unpleasant effervescence. As it warms (45° or higher) the roasty notes mellow and subtle coffee, chocolate and sweet coconut start to reveal themselves. This beer pairs well with sweet winter squashes like butternut because the sweet chocolate and coconut notes come forward and complement the sweetness of the prepared squash. The hops, roasty bitterness and carbonation all help cleanse the palate, which is especially important if you prepare your squash with savory toppings. Specific description and suggestion: South African Butternut Soup Soup Variation: veggie stock, no banana, olive oil to sauté and thick. Maui Brewing’s Coconut Porter is a perfect pairing with this soup recipe. This beer complements the sweetness of thesquash with its mild chocolate notes (when warmed) and its light coconut notesmeld perfectly with the coconut milk. The roasty bitterness and carbonation serve a dual purpose in this pairing. They both complement and accentuate the pepper flakes by increasing their intensity, momentarily. The roasty bitterness and carbonation also work together to cleanse your palate keeping this soup from becoming too sweet or savory. Yes it would, in fact there are carrots in this soup if I am not mistaken. They are a welcome sweetness against the spice. This was a natural pairing because of the coconut but a regular porter or a milk stout would work just as well. But a smoked porter sounds really good also.